A lifestyle blog with a mixture of travel, beauty, crafts, books, wildlife, food and more. Thursday in the Lake District was spent at South Walney nature reserve, a reserved ran by the Cumbria wildlife trust the only voluntary organisation devoted solely to the conservation of wildlife in Cumbria. The drive here was a long one, spent in and out of sleep. On arrival, we were given a brief introduction to the site by a staff member from the wildlife trust. South Walney nature reserve has been managed by the Cumbria wildlife trust since 1963, throughout the year its habitats such as sand dunes, beaches and pools provide homes for several plants, insects and birds. The nature reserve is also home to Cumbria’s only grey seal (Halichoerus grypus) colony which can be found in an area called the spit, a beach that is closed off from the public. Due to the public having no access to the beach, it provides an area free from disturbance. The first grey seals were first spotted in the 1980s who used this beach to rest on, over the years that number has now increased to over 200 with the first pups being born here in 2015. The grey seals were the reason we came to South Walney, as we were led to the pier hide (the best hide to observe the seals from as it looks over the spit) we saw our first glimpse of the grey seal, with their heads bobbing out of the water. As we were watching them, they were most definitely watching us back. Our goal here was to observe the behaviour of the seals over a period, to study the interactions between different individuals and to see if the behaviour changes during high and low tide as the mass of water in-between the pier hide and the spit floods during hide tide. Once in the hide, our first task was to observe the seals for half an hour creating an ethogram of behaviours observed during a 30-minute period. We saw a wide range of behaviours such as bottling, logging to spy hopping. After the 30 minutes, we then observed an individual for an hour making a note of their behaviour at every one-minute intervals (in total I recorded behaviour across three hours). The time budget for each behaviour was then worked out. What I enjoyed most about this activity was seeing how the behaviours of the seals changed during high and low tide. During high tide, seals were mainly observed spy hopping or potentially foraging for food there was little interaction between individuals. Once the tide started to pull out, getting lower and lower the behaviour of the seals changed. A lot more interaction between the seals occurred with a few groupings together, and signs of play behaviour. I really enjoyed this activity it was nice just to sit down for a few hours and watch the seals in their natural environment. Once we had completed our observation, we had a walk around the rest of the nature reserve. The site is also home to several birds and around 250 species have been recorded on site, many being passing migrants. Lesser Black-backed and herring gulls return in the spring to set up nest territories, this colony of mixed gulls is of national importance. We also spotted some cinnabar moth caterpillars (Tyria jacobaeae) feeding on ragwort (Senecio jacobaea). Ragwort is toxic to livestock and is often removed, however, cinnabar moth caterpillars feed on this plant and it is vital for the survival of the moth. For write up for this was probably the hardest and longest, which consisted of a report with hand-drawn tables and graphs. I must have spent most of the evening getting it done before finally getting into bed after a long day! This trip was taken in July 2018, see more of my Lake District posts here. When people make the switch to vegan they think about ingredients in food, often overlooking the ingredients in beauty products. You'll be surprised how many beauty products have sneaky animal by-products in. Thankfully, more and more companies are making the switch or releasing vegan ranges. 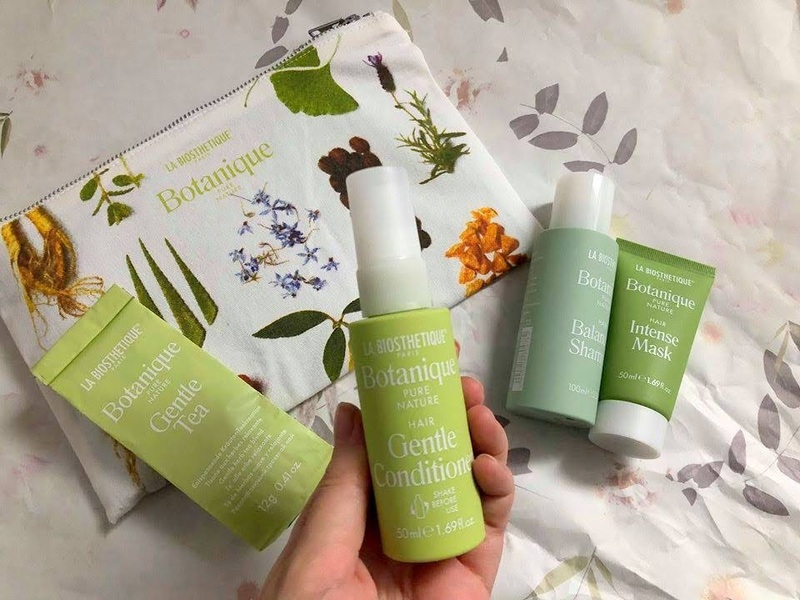 The new La Biosthetique Bontanique range has recently launched at the HairCareShop, a long established hair company with more than 90 years in the hairdressing industry. The Botanique range is 100% certified vegan and natural range free from animal ingredients, parabens, mineral oil, sulphates and alcohol. The range is split into three groups, gentle for mild cleansing, care and styling with calming extracts such as ginkgo and lavender scent. The Botanique gentle conditioner (from £15.98 150ml) is gentle and kind to the hair adding extra moisture. This conditioner is perfect for those living a busy life or in a hurry, you simply spray this conditioner onto wet/damp hair and leave in. The conditioner has a very light, fragrant scent to it. I did find this product added extra moisture to my hair and left it feeling soft, however, I do have to avoid using this near my roots as my roots can become very oily a lot quicker if I use too much product on them. They have a balancing range for harmonising, free from perfumes so gentle for the skin and hair. The balancing shampoo (from £15.04 250ml) contains mild surfactants to aid in the dispersal of the shampoo, a little of this shampoo goes a long way and works into a rich lather. Like the conditioner, this has such a light, fragrant scent which I really enjoy. Last in the range is intense for invigorating, activating and intensive care with energising ingredients such as lemon and mint. The hair mask (from £18.80 125ml) is probably my favourite product out of the three. It is such a creamy mask that provides a deep conditioning of the hair, whilst my roots can be oily my ends are very dry and this left them feeling soft and silky. Again, this product smells amazing so leaves your hair with a lingering earthy smell. The products came in a such a beautiful cosmetic bag, decorated with all things botanical to match the products. As much as I have enjoyed using the Botanique hair care products I may love this bag a little more and after a day of pampering what better way to finish of the day with a light, refreshing tea? *These items were gifted to me in exchange for a review all thoughts and opinions are my own. I was kindly sent another to giveaway, to enter you must follow the haircareshop on facebook and twitter! Reptiles and amphibians are the most threatened groups of vertebrates across the globe. Amphibians are most threatened with extinction due to several factors including climate change, pollution, invasive species and disease to name a few. On the reptile and amphibian day in the Lake District, we visited two locations to survey for reptiles and amphibians. Surveying for reptiles is often done early in the morning, so the temperature is just right to catch reptiles basking before it gets too hot during summer. Reptiles are ectotherms meaning they rely on environmental heat sources for body temperature. Native reptiles that can be found within the UK include the common lizard (Zootoca vivipara), the sand lizard (Lacerta agilis), the slow worm (Anguis fragilis), grass snake (Natrix natrix), smooth snake (Coronella austriaca) and the adder (Vipera berus). Habitats that reptiles can be found in include heathland, sand dunes, garden, scrub to woodlands). Surveying for amphibians can be done during the day or at night, native species include the common frog (Rana temporaria), common toad (Bufo bufo), natterjack toad (Bufo calamita), great crested newt (Triturus cristatus), palmate newt (Lissotriton helveticus) and the smooth newt (Lissotriton vulgaris). Habitats that amphibians can be found including terrestrial and freshwater habitats. Our first stop was Grune point, a site located near the coast filled with a mix of habitats including lowland bogs, saltmarshes and wet grassland. Grune point is located on the Solway coast a designated area of outstanding beauty. Surveying involved walking across the site, looking in areas where you might expect to find reptiles and amphibians. Shortly after arrival, we came across thousands of crab shells, for a moment my mind completely went blank, I thought they were dead crabs. I forgot momentarily that crabs moult, crabs (and other crustaceans) do not grow in a linear fashion, the hard outer shell (the exoskeleton) does not grow and can become too tight, when this happens the crab moults and climbs out of the shell. This period is a very vulnerable time for a crab as its soft body is exposed to predators. Although a new shell has begun to grow, it may take several days to harden and up to a month for the shell to become completely hard. Unfortunately for us and the hot weather playing a factor, we did not come across any reptiles. I was slightly disappointed, I have only ever seen an adder in the UK. However, this site is home to natterjack toads, Britain’s rarest toad and is protected in the UK under the Wildlife and Countryside Act (1981). It is illegal to damage its habitat or deliberately capture, kill, injure and disturb them. Saying that we were with someone who has a license for natterjack toads and we did not deliberately disturb this individual, coming across him was more of a happy accident. Although we did not see anything else in this location (along with a glimpse of a brown hare) it was such a beautiful location just to go on a walk. Our next stop was Cliburn nature reserve which is home to a range of communities such as fen, bog and heath. This place is also known as tick wood, and one girl did end up finding several on her body after a visit here. Here, we looked under refugia that had been laid out and found several newts (palmate and smooth) you can tell the difference due to the palmate having webbed hind feet and common frogs. I fear frogs and toads, mainly down to the fact they can jump… But here we had to swab a frog as part of our assessment for the day. The amphibian chytrid fungus is a disease which is a prominent factor of several extinctions in many species, we took swabs from several individuals which would later be tested to see if the fungus is present in this area. Even though we did not get to see any reptiles, today was such a fun day. Are you a fan of reptiles? Still feeling sleepy from the day before, I managed to get up and drag myself to breakfast. Today, I did bee biology, however, if I had known we wouldn’t be starting till 10 and we were doing the practical on site I would’ve stayed in bed and had toast for breakfast! The day was broken up into 2 parts, the first part of the day we were surveying bees, counting the number of species and what plants they visit, whilst the second part of the day was spent in the lab. My knowledge of bees is basic and my identification skills are not the best, because let us be honest they all look orange and black, fluffy and very similar to each other. But did you know there are approximately 250 species of bees in the UK? Bees play a very important role in pollination, plants rely on pollinators likes bees to help them reproduce, when a bee collects nectar or pollen from a plant, pollen from the stamen (the male reproductive organ of the plant) attaches itself to the bee. Plants have evolved over time to attract certain pollinators this can be seen in the shape of plants to the colours of plants. For the first part of the day, we spent two hours surveying bees in three different locations (from a garden to a patio and a planted area) each survey area time was 30 minutes. The most common bees we saw throughout the day were the common carder bee and the white-tailed bumblebee (if we identified correctly…) It was interesting to see how the bees react to the plants around them, in one area we had white-tailed bees and common carder bees, rather than visiting the same plants the white-tailed bees visited creeping thistle plants whereas the common carder bee visited a Hosta plant, both are very different in appearances. Lavender and purple coloured plants were also visited more than others, bees are said to be attracted to the colours blue and purple more so than other colours. It was interesting to see the relationship between bees and plants and observe the bee’s behaviour whilst collecting pollen. We were also extremely lucky and saw a hummingbird moth, although I failed at getting a photo due to it being extremely quick. In the afternoon, we were in the lab doing a dissection of a honey bee (Apis mellifera) where we had to answer a set of questions about the bee. (All bees died off naturally!) The questions ranged from discussing the external features of the bee, talking about how bees can fly, to why bees die after they sting. We answered these questions by pulling the bee apart and examining them under microscopes. For example, there has always been a lot of discussion on how bees fly as their wings appear too small for their body size, however, after we worked out the wings loading weight a bee’s wings aren’t too small for its body! The wings are specially designed structures, the forewing has a trailing edge that has a fold on the end, whereas the hindwing has hooks which attach to the forewing which creates a larger surface area which allows for flight. Or did you know that the hind leg of a bee is larger due to carrying the extra weight of pollen, or that when a bee stings you they leave behind their stinger along with their intestinal tract, muscles and nerves? Overall, I really enjoyed bee biology. I learnt a lot! Do you know any fun facts about bees? I love beauty products and although I rarely invest money into beauty (choosing to spend my money elsewhere) I love finding and trying new products. Khadi isn’t a brand I have heard of before, but I instantly fell in love with the concept of the brand. Khadi nature products are natural, vegan and cruelty-free (with all these amazing cruelty-free and vegan brands, it makes me question why people still buy products tested on animals, but that is another story). A little background about the brand, the owners of Khadi spent many years exploring India learning about the Ayurvedic principles, if you are unfamiliar of these principles like I was, the principles basically mean that every person has a unique proportion of biologic principles known as doshas, these are Vata (air), Pitta (fire) and Kapha (earth/water). Each person is a unique combination of these three doshas, different proportions of each kosha existing within a person. Ayurveda treats well-being and health as an interlocking whole of mind, body and soul. Merging their knowledge of Ayurveda and the knowledge of India’s sages of herbs and oils they created Khadi. All products are made in India, it is in their policy to create rural employment without harming nature. I was sent three products to try from the Khadi range. Khadi shampoos are made from essential oils, plants oils and ayurvedic herbs. They work the scalp, hair and mind, gently cleansing and moisturising the hair and scalp. The nutgrass contains as it says nutgrass, aloe vera, turmeric, acacia, orange, mandarin and lemon essential oils. This product aims to add volume and shine, to generate elasticity and promote hair growth, amongst many other things. This shampoo is the deepest of orange and it smells INCREDIBLE, with the fruity mix of lemons and oranges. For me, I would class my hair type as dry/limp but with oily roots, I use this shampoo on my roots/scalps only, using an alternative on my ends. I have in the past trained my hair, it can usually go several days without washing, since using this shampoo I can usually push it an extra day. My hair overall looks a lot healthier with added shine and bounce. Khadi hair oils improve the condition of the scalp and hair. They contain sunflower, sesame and almond oil which help revitalise dull and dry hair. This one is recommended for hair loss and thin hair as it helps stimulate hair growth. The oil is easy to use, adding a little at a time until hair is fully covered, I usually leave this product on overnight. Like the shampoo, this product smells amazing, a light, exotic scent that lingers in my hair after use. I have enjoyed using this product so much, my hair has loved it. It feels softer after every use and I feel like my hair is becoming stronger. My only problem with this item, is the packaging, the oil sits in a glass tube (can’t recall the actual name) there are no pumps to push the oil out, instead, you have to tap it against your hand to disperse the oil. This herbal face mask has anti-bacterial and antiseptic properties, recommended for an effective deep cleanse which helps remove toxins and impurities from the skin for healthy, glowing skin. This mask comes in powder form, packaged in a cute little tin. You add water to create a mask, getting the right quantities of water and powder took me a while, and I usually mixed the two ingredients together using the base of the lid of the tin. I don’t know what is going on with my skin at the moment, but it is the best it has been in the longest of times. I don’t know if that’s because I have taken products out of my routine or added ones in, but I do know that after using this mask it hasn't caused any problems with my skin. After use, my skin has appeared to look fresher, brighter and less oily in areas. Overall, I have enjoyed using these products so much. They smell amazing, the oil and shampoo have done wonders to my hair. I love trying new products, but it is ten times better when a product does what it says on the label and these 100% have. I can’t wait to try more products from this brand, I already have my eye on their herbal hair colours to hide my grey hairs! *These products were sent to me for review purposes, all thoughts and opinions are my own. I am 27 years old, and for as long as I can remember I have struggled to make friends, especially long-term friendships. Friendships are relationships that are meant to bring joy to your life, an ear to moan to, someone to go out and do things with. For a while, I tried to own the lone wolf label, that I was okay with it just being me, that I was okay not really having some friends I could count on, people who would be there for me, and I for them for the long run. But in the end, despite all that nothing can stop you from feeling lonely, to yearn a little bit of human interaction. As an adult it gets harder to make friends, you’ll find most people already have their own friendship group, or that people are too busy to make new friends. Where do you even begin? None of the friendships I have made over the last 27 years have really stuck. As a child, I had 2 best friends, let us refer to them as Elle and Milly. We lived in the same neighbourhood, at most five minutes apart, although we all met by attending the same school, me and Milly met in a nursery, and we both met Elle in year 2. We would spend our time together after school or at weekends, going to each other’s houses or going to the park to play. Eventually, Joanne joined our group, moving from another school during year 5. Although we were all friends with each other, things began to change. Friendship within the group began to feel like a competition, it became who was your favourite best friend. I started to feel left out, I used to love coming home from school and ringing up my friends or waiting for them to call me to see if anyone was coming out to play. Eventually, the phone calls after school became less, or I’d ring one friend for her to say she isn’t coming out, to ring another friends house to find out they are together. Although I could appreciate the fact all of us didn’t need to be joined at the hip, or that we can spend time with one friend and not the others, it still hurt. I often became the person people would call if the others weren’t available. As I got older, I started to worry about people not showing up for birthday parties, so instead, I would invite these 3 best friends to the cinema, along with my family. The last time, I celebrated my birthday with friends was over 10 years ago, we had gone to the cinema to see one of the Lord of the Ring films, the films were always out around my birthday. Afterwards, we decided to go shopping, as most young girls our favourite shop was Claire’s accessories. At the time they were selling friendship keyrings and bracelets, the ones that you split, one friend has the best half and the other friend half. The three of them decided to buy these friendship bracelets/chains and I got completely left out of the whole buying and swapping of them. I remember them coming out and showing me, the words that came out my mouth didn’t reflect how I felt on the inside. I was sad, and I could not understand why they would have to do it whilst out celebrating my birthday. I was a sensitive child. During secondary school, me, Elle and Milly were placed in the same tutor, whilst Joanne was placed in a different one. Joanne made her own friends and decided she would no longer be walking to school with us, in favour of a new friend. Eventually, we stopped hanging and talking. Milly became one of the popular kids and although we would still speak to each other occasionally, we never had real conversations and I wasn’t one of the popular ones. Although I did make new friends at school, none of those friendships lasted once school was over. I could see all these people around me with these solid friendships and I wondered if that would ever be me. The only friend that remained was Elle, who was there from the beginning. This friendship lasted until I was 18. The whole time I was friends with Elle I always felt like she was trying to replace me, and although we hanged around the same people I would often find she would try and exclude me from the group, forget to invite me places or would just go without me, sometimes I felt like she would only want me there if I had something she wanted e.g. when I eventually got a car. My friendship ended when I got a boyfriend, Elle had recently become friends with his ex-girlfriend. They had a toxic relationship, which involved cheating etc. Although at the time Elle was properly trying to look out for me, she gave me an ultimatum of her or my boyfriend, I chose the latter (which some of you may agree or disagree on that). But at the time I couldn’t really understand why I was given an ultimatum, due to the fact she had become friends with his ex-girlfriend. Friendships not lasting has been a reoccurring theme for me, from the friends I made college or the ones I used to work with (a place I worked at for 5 years, and although I still talk to a few people, I haven’t seen anyone for almost a year). Sometimes, I question if there is something wrong with me? Is there a reason why I can’t maintain relationships? Am I a bad friend? When I look at people I used to go to school with they are still friends with each other it makes me sad that I don't have that type of friendship with someone and maybe never will. At the same time, as we get older, I understand that people have so much going on in their own lives, that it is normal for friendships to drift apart etc. Last year, I decided to go to university in another city in hopes of starting afresh and meeting new people, and I have. But despite making new friends, I always have this thought in the back of my mind of ‘how long will this last?’ At times, I have learnt to block it out so I can learn to appreciate and enjoy the friendship and make memories. Does anyone else feel like this, that they struggle to make lasting friendships? When picking the activities I wanted to do at the Lake District I tried to cover different activities from surveying, ethograms and biology. Along with that, I also wanted to study a different class of animals each day (based on the taxonomy chart). Since the nature reserve visit to Leighton Moss focussed on wetland birds, I already had birds crossed off. For the week I had picked activities that involved mammals, insects, crustaceans, reptiles and amphibians. My first activity was shore ecology which took place at St. Bees. The aim of this activity was to distinguish if zonation was present on the coast at St. Bees. Zonation is the categorisation of biomes into zones, it looks at the distribution of plants or animals within the habitat to see if environmental factors e.g. altitude, temperature, biotic factors etc. determine distribution. Plants are usually a better indicator of zonation due to their inability to move, whereas animals are mobile. To do this, we used 100-metre tape and metre square quadrats and made a note of the species found within each metre. Since there were loads of us we were split into groups of 3/4’s and once we had finished a quadrat we would move onto the next available metre. Out of all the activities I did over the course of the week this one was my favourite, I felt like I really engaged with the activity and learnt a lot from it. The hardest part of the day was walking over the rocks, they were so slimy and slippery I almost fell several times. I learnt a lot about being able to identify different species of seaweed from channel wrack, egg wrack to bladderwrack, as well as identifying species such as flat, edible and rough periwinkles. The heat did get the better of me on this day and I ended up slightly burnt on my scalp and the back of my shoulders/neck. · Channel wrack was found to be dominant to abundant before 30 metres, this species of seaweed is often found closer to the shore due to adaptations that allow it to survive in areas where desiccation (state of extreme dryness) occurs. Adaptations include having leaves which have channels that fold in on themselves, thick cell walls and mucous to prevent water loss. Spiral wrack can also be found closer to shore, the spiral surface helps reduce the loss of water. Egg and bladderwrack can be found closer to the sea and lack adaptations to survive desiccation, and both have very similar adaptations which may also cause competition between the two species. Both these species have air bladders which aid in buoyancy. Barnacles and limpets are species which are common representations of mid to high intertidal regions (intertidal meaning being exposed to low air at low tide and covered with sea water during high tide). Although both species can survive in areas where desiccation occurs, most were found after 34 metres this may be due to their ability to move to conditions which are more favourable. For the day, and work completed I got 73% which I was happy with. I was so ready for bed after everything was done! And next time I ever head down to a beach and find rock pools I will definitely be having a look in them to see what I can find. As part of my fieldwork module at university, we had a compulsory trip to the Lake District during the summer holidays. Fieldwork skills has been one of my favourite modules on the course so far, I truly feel in my element being outdoors. Surprisingly though prior to this trip, I had never been to the Lake District so I was interested to see if it would live up to my expectations (it did). The trip was from Sunday to Saturday, our first day was spent travelling to Penrith and a stop at Leighton Moss. The Monday to Friday we would be doing different activities, which we had picked prior to coming to Penrith, for each day we would have to do a write up/work in the evening, only 2/5 days would be graded and put towards our final grade, we weren't told which days were being marked (I now know Monday and Thursday were the days that were graded). As I have mentioned en route to Penrith we stopped at Leighton Moss for a taster activity for our fieldwork books. Leighton Moss is home to the largest reed bed found in the north-west of England, I have been to a few nature reserves within in the UK and this one has to be one of my favourites, I only wish I had more time to explore. It was beautiful, with pathways leading off in different directions, streams, birds flying everywhere. On arrival, we were given a talk by a staff member who was interning at RSPB. It was hard to take notes, write and listen at the same time but he spoke about the habitats found on site, management and conservation. Habitats which can be found at Leighton moss include limestone grassland, woodland and reeds. The reeds are important as they provide a habitat for important breeding populations from marsh harriers to bitterns. Woodland provides important nesting habitats for numerous of birds e.g. woodpeckers to bullfinches. Whilst ponds support animals such as frogs, newts, eel to dragonflies. Closer to the shore near Morecambe Bay habitats such as mudflats, coastal marsh and saltwater lagoons are found, wading birds such as curlew and oystercatchers can be found using these habitats. Along with that wildlife such as otter, foxes, badgers and deer can be found on the reserve in areas nearby. On a whole a wide range of species use this reserve, it is a very important wetland site, an important area for many species of birds, Leighton Moss is a Site of Special Scientific Interest and a Special Protection Area. Due to the habitats, management is in place to ensure they thrive, management includes the cutting of reeds in summer and winter, this can prevent them drying out and prevent intrusion of saline intrusion from the coast, grazing of inner marsh using cattle to allow for suitable conditions for birds all year round, whilst the grassland is also grazed with cattle and woodland is managed with rotational coppicing (cut back a tree to ground level to stimulate growth). At the reserve, we were split into groups, each one of us going to a different hide to do an observation task. The hide we went to I believe was the Grisedale hide which looked over scrub and reedbeds. The task was to make an ethogram, which means observing a chosen species and recording the behaviours seen, then make a chart and watch one individual and record the behaviour the animal is seen doing every minute, eventually working out a % for each behaviour spotted over a course of time, followed by a brief conclusion/explanation as to why this might be. It was a fun little activity and we saw many different species of birds and even spotted a red deer. After this, we headed to the accommodation we would be staying in called Newton Riggs College, set in a 200-hectare estate. During the summer holidays, they work as a bed and breakfast. Overall, I really liked the accommodation, we were all in blocks of 8 with our own bedroom/bathroom and a shared kitchen. The catering team on site was amazing, they accommodated dietary requirements amazingly, I had some incredible meals over the duration of the week. What are your favourite nature reserves within the UK? I am someone who loves to enter competitions because who doesn't love winning prizes? I've entered lots of competitions whether it's filling out a survey to retweeting a tweet and I've been lucky enough to win quite a few nice things over the last ten years, once even winning an iPod (although I am still waiting to win a holiday...) A few weeks ago I was lucky enough to win a case of elixirs from humble warrior, prior to this they weren't a brand I was aware of but what caught my eye was the fact the elixirs are vegan, certified organic and have no refined sugar. Humble warrior believe in the power of plants, in ancient traditions, super plants were consumed in small doses regularly as part of a balanced diet, adding the plants to curries, teas or other drinks and food. Head over to the humble warrior website if you would like to find out more, the whole concept of this drinks feels very spiritual and at one with the world, if that makes sense? But it is right up my alley, they also have a list of super plants and talk about the healing/well-being properties of each plant. Each drink combines water and planet extracts, there are three flavours to choose from, each one focusing on a different aspect of well-being. I was sent a case 12, 4 of each flavour meaning I got to give each flavour a good try. Tiger Spring - for vitality. Containing key ingredients of panax ginseng, turmeric and cinnamon. I feel like this would have been the perfect drink if I was feeling ill, however, during the course of trying these drinks I wasn't. The panax ginseng is believed to support immunity and counter stress, whilst turmeric helps with resilience, supporting immunity and have anti-inflammatory properties, cinnamon aids in digestion and helps brings balance to the body. I found each flavour to be refreshing, thankfully the cinnamon in this one wasn't too over-powering. Divine Oasis - for focus. Containing key ingredients of tulsi, matcha and ginger. Containing ingredients such as matcha to boost energy and improve concentration, tulsi to enhance mental clarity and ginger for a boost and improve digestion. I tried this one on a day I was in one of those moods where I really should do something but I don't want to because I can't stay focussed long enough. I don't know if it was a placebo effect but almost instantly I felt more alert and awake and ready to tackle the day ahead. Lunar Nectar - for calm. Containing key ingredients of reishi, cacao and chamomile. Out of all of these drinks, this one for me worked the best for its claims. Since I had 12 drinks, I only had one a day to savour and make them last a bit longer. There were a few nights I was struggling to sleep, I couldn't get comfy, my mind could not switch off at all. After feeling like I was going to have another restless night I took one of these before bed and no exaggeration I had one of the deepest and best nights of sleep I have had in the longest time (I felt like this every time I had one of these before bed), I woke up feeling refreshed and relaxed. Ingredients such as chamomile help fight free radicals and support sleep, whilst reishi helps enhance mental clarity and counter stress. I have tried so many different health drinks in the past, thankfully, unlike some of the previous ones I have tried the taste of these ones weren't overpowering, you can tell you are putting something good into your body and the drinks are so refreshing. I wasn't really sure if I was going to like these, but I am so impressed and I would definitely consider purchasing a case of these. Have you heard of humble warriors before or tried any super plants? Whilst in Scotland with the practical wildlife society, on top of doing community work in the garden we got to visit several places in Scotland. 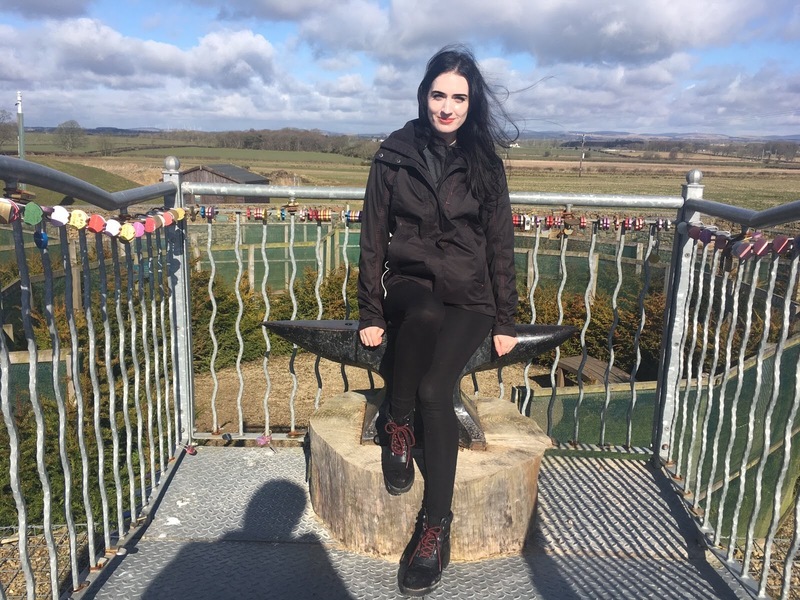 I feel so blessed to have gotten to visit Scotland twice this year, it truly does feel like LOTR with breath-taking scenes of nature, along with extremely picturesque towns. On the day we went to Scotland we stopped off at two places, the first being Gretna Green, prior to this I had never heard of Gretna Green, but it turns out my Aunt got married here. Gretna Green has a romantic history and it reminded me so much of kissing town from the 10th Kingdom. It is assumed that Gretna’s famous runaway marriages began after the Lord Hardwicke’s Marriage Act came into pay in England, the act states that if the parent of a minor (under 21) objects to the marriage they could prevent the union, this act did not apply in Scotland, where children could marry at 14 (boys) and 12 (girls). Gretna Green was the first easily reachable village across the border. Scottish law also allowed anyone to conduct the marriage ceremony if two witnesses were present. Many blacksmiths performed the ceremonies and became known as the anvil priests. The centre was pretty with a blacksmith museum, shops, statues of couples or ones resembling love. After looking around the centre, I went to try out the maze which was located nearby. I love doing mazes, thankfully this one was easy to navigate around. In the middle of the maze was the legendary anvil, the tradition of a blacksmith striking the anvil to seal the marriage began when the first couples eloped to Gretna Green in 1754. The anvil became a symbol of romance and it is said if you touch the anvil good fortune in affairs of the heart will be yours, so of course, I had to touch it. It really was a beautiful little spot. The second stop was Edinburgh, we roughly had an hour here so on a whole we didn’t really get to do much other than have a quick walk up to the castle. Despite the quick visit I quickly fell in love with Edinburgh’s historical buildings/architecture and I have added it on to my list of places I need to go back to. If you’ve been before what would you recommend doing? Pitlochry is the closest village to FSC Kindrogan and one afternoon having finished for the day on the garden we spent the afternoon here. The town itself retains many stone Victorian buildings, it became a tourist resort after a visit from Queen Victoria in 1842 and became easy to travel to when the railway arrives in 1863. Many people use Pitlochry as a gateway for hillwalking, mountains close by including Schiehallion and Ben Vrackie. I don’t know about you, but I love wandering around villages that retain a historical vibe to it, it is almost like going back in time. On top of that, I am a big fan of gift shops filled to the brim with knickknacks (even if I don’t buy anything I love seeing what I can find). Again, we spent about an hour here just walking in and out of shops. Located near to Pitlochry is Black Spout wood named so after a waterfall that resides there. There are two waterfalls here (of what we saw) we originally went to the smaller one thinking it was Black Spout, however, to get to the smaller one we had to climb through bramble, down hills, over branches and logs. It was only when we were there did we realise the actual Black Spout was further, the smaller waterfall though was still worth the walk. Located uphill was the other fall as you approach you can hear the soft roar of the water and then out of nowhere the fall appears in between the trees, which can be viewed from different areas depending on how far uphill you want to walk. Another place we visited was Killiecrankie, to visit the soldier’s leap. The soldier’s leap is a flat rock located near the water edges, it is claimed that Donald McBane a redcoat soldier who was fleeing the battle of Killiecrankie leapt 5.5 metres across the river Garry, whilst being pursued by Jacobite clansmen. The Jacobites were victorious but are said to have suffered heavy casualties. This area was actually stunning, due to an unusually cold Spring it felt like Autumn and we still had the remnants of burnt orange leaves clinging onto trees, against the contrast of the bright greens of evergreen trees. It was worth the little trip to see a soldier’s leap. A short drive from Pitlochry is the famous vantage point which offers panoramic views of Scotland, known as the Queen's view and often mistakenly believed to be named after Queen Victoria when in fact the location is named after Queen Isabella who often used this spot as a resting place on her travels. We visited the Queen’s view on our drive back home to Wolverhampton, unfortunately for us, we were greeted with wet, misty rain. Despite the unperfect weather conditions, the view was still an incredible one. Scotland is truly a magical place if you’ve been lucky enough to go (or live there) where are your favourite spots? Other than coming to do volunteer work and sightseeing, we had come to Scotland for the wildlife! And Scotland didn’t disappoint, it was like almost walking into a magical realm because no matter where you turned there were animals to be seen. I saw my first ever red squirrel within a matter of seconds after arriving at FSC Kindrogan, looking for food or burying in a pile of crunchy leaves. It was an animal I did not grow tired of seeing over the course of the week. To me, I feel like they are the elves of the animal kingdom as strange as that might sound with their little-tufted ears. The society planned activities throughout the trip to help us learn about different techniques to track/monitor animals etc. On-site at FSC Kindrogan was an animal hide, we spent a few hours here most nights to see what the camera had captured throughout the day and into the night, we mainly saw deer, mice and birds. We did, however, catch pine martens (although I am yet to see them with my own eyes). Pine martens were once found throughout the UK but are now confined to the north of the UK in Scotland highlands and north of England although populations here are often small and fragmented areas. It was so exciting to watch a pine marten enjoying the bait which was put out. Other activities included looking for bats (due to the cold we didn’t pick up any frequencies on the monitors) and moth trapping, both were conducted at night, so I didn’t take any pictures, it was also freezing and by night I was always so tired after working throughout the day. However, for the bats, we got to listen to recordings and have a go at identifying what species we thought we could hear. This was hard, they do sound very similar at times. On the last night, we also had a stargazing night and a fire in the completed garden. It was the perfect way to celebrate the completion of the garden. Have you ever had any amazing encounters with an animal? TREK AMERICA, THE BIG ISLAND, HAWAII. DAY THREE.